Titled Text: "I tried converting the prices into pizzas, to put it in more familiar terms, and it just became a hard-to-think-about number of pizzas." Does anyone else still get those feelings of "I need an adult" sometimes? The Synologist wrote: Does anyone else still get those feelings of "I need an adult" sometimes? Oh yes. Last monday a real estate agent came by to estimate the value of my apartment. I spent the entire weekend cleaning. Really needed an adult to tell me if I should clean out the closets too. The number he came up with told me nothing. Not even my usual trick of converting it into gaming PCs helped. I can sort of visualize 63 monster PCs, but not really. $10,000 USD is approximately 757 pizzas, more or less depending on who's selling you pizza. My parents' first house, as a unit for any and all real estate purchases. Wow did $30k go a long way back then. Yeah, you gotta use things bigger than Pizzas. Personally, I use Motorcycles, since it's easier for me to think of them as valuable commodities than as anything I would actually keep for personal use. "Thing" units are fine for smaller items, but when dealing with amounts that you will probably finance, it's best to convert money units into time units. "years of salary", "years of net savings", "years of working a second job"... stuff like that. Of course your conversion factor will depend on your situation, but it's a better handle than "747 pizzas". Unless you really do eat a lot of pizza. ucim wrote: "Thing" units are fine for smaller items, but when dealing with amounts that you will probably finance, it's best to convert money units into time units. "years of salary", "years of net savings", "years of working a second job"... stuff like that. Of course your conversion factor will depend on your situation, but it's a better handle than "747 pizzas". This probably isn't a bad notion. Still...hmm. Three or four brand-new Les Pauls...six Rickenbacker 4003s...mmm...what were we talking about, again? Or perhaps...a 747 FILLED with pizzas. Hmm, how many pizzas could a 747 carry? Quick, to the What if machine! I try to convert larger amounts of money to months of basic needs (rent+internet+food currently), but that doesn't really help: quite a few singular expenses (a computer, plane tickets, a holiday, a vehicle) cost multiple months. And when you get to things like selling/buying houses, a small difference in price may be years of basic needs. I apply sort of the reverse of this kind of unit conversion: I think of every expense in terms of how much difference will this make in when I finally end up owning a house, since I'm at a point in my life where I can pretty easily afford anything except a house, but affording a house, any house at all, is a ginormous all-consuming lifelong endeavor that's basically all that matters anymore. 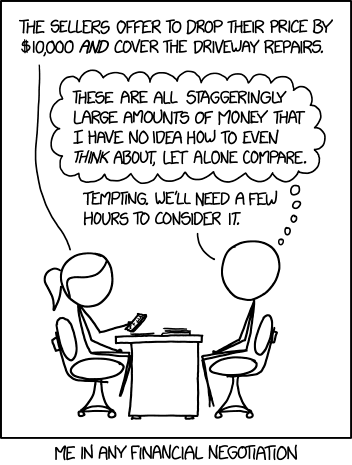 A smallish frequently-recurring expense adds up to a lot over a lifetime and may add years to that endeavor in the end, and so make me hesitate more than one single large one-off expense that I can just shrug "okay that only puts me a month behind, so long as that doesn't happen a lot I can live with it." And thus the (US) national debt. There are about 120,000,000 households in the USA, so they each owe about $166,000. Or 12,500 pizzas. And I rounded down the debt, to the tune of about 175 billion. A rounding error of about 13 billion pizzas. Which itself includes a rounding error of about 250 million pizzas. With a population of 325 million, the rounding error on my rounding error feeds all of America tonight. That's a silly amount of money. ...I used to mentally price things in CDs. Compact Discs, not certificates of deposit. Which is about the same units as pizzas. I wonder if everyone is ultimately like this, and that's a big factor in why people can get away with charging so much for some things. And, conversely, an expectation that almost everything worth buying ought to be within the "not staggeringly huge amount of money" range is why some companies resort to shortchanging everyone on the production line to keep the sticker price so low. Like, compare this to how things used to be. A TV used to cost as much as a car. Just a basic, 8-inch-screen TV that can get three channels if you're lucky and none of them have anything worth watching on because it's 1950 and nobody's going to invest good money in entertainment that 90% of the country will never see. Today, I can buy a nice TV and the latest game console for less than a tenth of what a new car costs. I could buy a decent gaming computer and a top-of-the-line VR headset for maybe twice that. There are no consumer electronics that cost anywhere near the price of a new car that aren't artificially inflated for the sake of conspicuous consumption. And, in all likelihood, none of it will last more than five years before it breaks, because that's what happens when you outsource parts and labor to the lowest bidder on the entire planet. Steve the Pocket wrote: I wonder if everyone is ultimately like this, and that's a big factor in why people can get away with charging so much for some things. And, conversely, an expectation that almost everything worth buying ought to be within the "not staggeringly huge amount of money" range is why some companies resort to shortchanging everyone on the production line to keep the sticker price so low. Like, compare this to how things used to be. A TV used to cost as much as a car. Just a basic, 8-inch-screen TV that can get three channels if you're lucky and none of them have anything worth watching on because it's 1950 and nobody's going to invest good money in entertainment that 90% of the country will never see. Today, I can buy a nice TV and the latest game console for less than a tenth of what a new car costs. I could buy a decent gaming computer and a top-of-the-line VR headset for maybe twice that. There are no consumer electronics that cost anywhere near the price of a new car that aren't artificially inflated for the sake of conspicuous consumption. And, in all likelihood, none of it will last more than five years before it breaks, because that's what happens when you outsource parts and labor to the lowest bidder on the entire planet. Tech generally doesn't NEED to last 5 years (or more). There's something newer and a hell of a lot better by that point. Planned obsolescence for a vehicle that would otherwise be permanently useful is one thing, but just about everyone is happier to have a new computer 5 years from now than to keep running the same old toaster forever. That's especially true when the new one cost a fraction of the amount that the eternal toaster would. Mikeski wrote: And thus the (US) national debt. This is a fundamentally flawed analysis. The US government owes money to the bond holders, and debt repayment can be delayed by borrowing money to rebuy the bond. Now why would someone want to pay off their debts within a short or medium time frame? Because they're afraid their income might decline in the future due to old age. Except the US government isn't a person. It's an immortal being that lives and breathes vast throngs of people. The United State's ability to pay and borrow is dependent on it's natural resources and it's human capital. The human capital grows as the country grows, and as it absorbs the strength of other countries. I thought the standard referent for all comparisons was an elephant (or a football field). 10000 dollars buys you 35% of an elephant according to a not at all suspicious website I checked. This is a fundamentally flawed correction. I measured a rounding error of a rounding error of the national debt in units of pizza, and you called it an "analysis". When I was younger and much poorer, to the point that affording food was my main focus in life, I used to measure all expenses in terms of "how many meals will this make me skip?" Flumble wrote: I try to convert larger amounts of money to months of basic needs (rent+internet+food currently), but that doesn't really help: quite a few singular expenses (a computer, plane tickets, a holiday, a vehicle) cost multiple months. And when you get to things like selling/buying houses, a small difference in price may be years of basic needs. For medium purchases I translate it into the overtime I would have to do to pay for it. Really big numbers I translate into Civil Engineering projects. US national debt = 1000 nuclear power plants. Thing is, silicon chips and LCD screens are significantly cheaper to manufacture than half a cubic meter or so of vacuum, with the infrastructure to contain it, and suitable electrical components inside, outside, and penetrating the bottle. Yes, there's an element of saving money by out-sourcing manufacture to non-union economies, but there's also a significant element of higher technology being intrinsically cheaper and/or easier to manufacture. After all, modern cars include displays and computers more capable than anything you could get in 1950, and that's as, pretty-much, free add-ons. Yes, game consoles tend to launch at a loss, and then become profitable once the manufacturing costs drop, but that's because they're specced and priced for maybe 2 years post-launch rather than the current realities. Yeah, I also do that or divide by the expected time I'll be using it. Though those can go two ways too: my VR headset is still costing me about 10m€/s (I barely use it because most games, or 'games', cost even more than that and I haven't found the will to develop for it) instead of the expected 2m€/s or less, whereas my bicycle costs about 0.4m€/s (of use, more like 4µ€/s of ownership, which is a more important metric for personal transportation), whereas I expected more like 1m€/s or even 2m€/s. African or European Indian? And is that with or without the coconut? Association, American, Australian, Canadian, Gaelic, Rugby or Rugby? To avoid confusion, you should always state such intended area in an acknowledged standard like the MicroWales. A 747 could carry a quarter million large pizzas. Farabor wrote: Or perhaps...a 747 FILLED with pizzas. Hmm, how many pizzas could a 747 carry? Quick, to the What if machine! What is the limiting factor on that number? The volume, the mass, the heat, or regulations on the air quality in the cabin? The total Excess Baggage surchage? The reason some people want to pay off the national debt is so we don't have to continue paying more and more of our income in interest on the debt. The reason the people in power don't want to begin paying off the debt is they know the current system, with themselves in power, will not last long enough for that effort to benefit them.